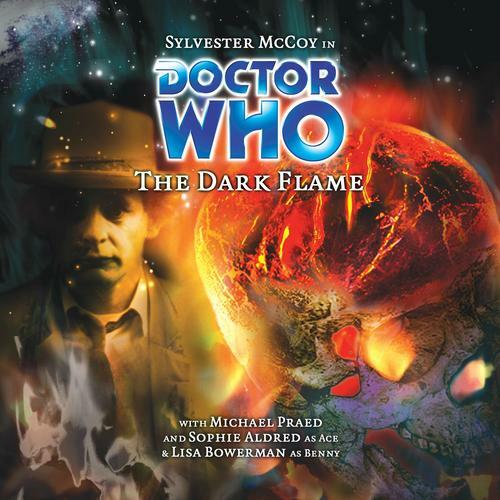 Sylvester McCoy is the Doctor in The Dark Flame. 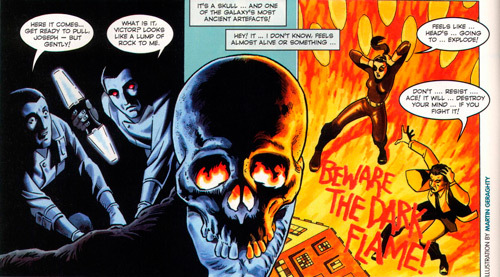 The Dark Flame is the second “side step” away from the main continuity of Big Finish Doctor Who and into the world of the Virgin New Adventures, a series of original novels written after the cancellation of the original series that covered the continuing adventures of the Seventh Doctor and his companion Ace. The novels contained more adult themes than the television series had; violence, language, and sexuality were all brought to the fore, sometimes for a story’s benefit and sometimes to their detriment. The novels also introduced one Bernice “Benny” Summerfield, an archaeologist adventurer who proved popular enough that the series focused on her once the BBC declined to renew the Doctor Who license, and then proved popular enough to warrant her own series of Big Finish audios. The trio of Seven, Ace, and Benny made their Big Finish debut with The Shadow of the Scourge, a serial that suffered from being incredibly mean-spirited and not quite being “listener friendly” to those fans who had never picked up a VNA novel, as familiar characters displayed completely different personalities. The Doctor was much more of a chessmaster who wasn’t afraid to sacrifice pieces in a very cold-hearted manner, and Ace wasn’t the street-tough young adult anymore, but instead a battle-tested space marine with a harder edge. While they fit into the expanded universe of the Virgin New Adventures, they ended up being a splash of cold water for Big Finish listeners. The Dark Flame is the second (and for now, the last) Virgin New Adventure for the Doctor. While the story itself is very simple and cut-and-paste, the performances from the main players, strong showings from the secondary casts, and a tempered use of violence compare to The Shadow of the Scourge make for an audio play that VNA fans will enjoy and Big Finish fans can somewhat appreciate, even though the play as whole just doesn’t add up as well as it should, considering the individual parts. On the way to pick up Benny from the Orbos research facility, the TARDIS’ are blasted with a cry for help from the Doctor’s old colleague Remnex. Remnex, a scientist on the facility, has been working with black light; energy generated by quantum meta-fluctuations in the space-time continuum. Incredibly dangerous, it seems that the black light has caused Remnex’s demise. But Remnex is still alive, with his colleagues Slyde and Lomar, preparing for the culmination of their experiments. Benny, assisting with the set-up, is worried. Not that the Doctor and Ace are late (as usual), but that her colleague Victor, a fellow archaeologist, missed their arranged meeting on Orbos a few days prior. With a very simple set-up, the first episode of The Dark Flame lays everything out that the listener needs to know. Isolated scientific outpost, desolate and deadly planet, an experiment gone wrong, an ancient evil coming back from the dead…this serial could have easily come right from the Fourth Doctor era, as the whole setup fits Tom Baker to a tee. Trevor Baxendale, the script’s author, keeps the pieces simple and the plot moving, jumping between location and location without confusion or a wasted breath. Sylvester McCoy’s Doctor in the Virgin New Adventures is definitely not the buffoon we saw alongside Melanie Bush. He’s the planning, shrewd, crafty Doctor that figures out early on what is really happening and maneuvers his foes into doing precisely what he wants them to do. McCoy’s performance was the highlight of the otherwise “bleh” The Shadow of the Scourge, and he manages to roll that performance over into The Dark Flame, but drops the willingness to put other people in the way of major harm. Some listeners criticize McCoy for what they feel are lackluster performances through some of his Big Finish audios, but in this one, I think McCoy plays it more stoic and concerned, especially considering the dangers that Ordos faces due to the experiments with black light. There are his hammy moments, of course, but those go with the Seventh Doctor when McCoy chooses to take it over the top. I’m glad that this is the last time Sophie Aldred voices “Space Marine” Ace in Big Finish. It’s hard enough listening to the middle-aged mother sound like a recovering juvenile delinquent in the main line (which is why I appreciate the ending to Colditz, the introduction of new companion Hex in The Harvest, and the forthcoming character development), let alone imagining the same voice actress as a battle hardened Space Marine! Aldred’s performance here is still hard-edged, but much less jaded than in The Shadow of the Scourge, and thankfully MUCH less screamy and angsty than she was in The Rapture. In her battle suit, Ace is tougher than nails and willing to play “hide the evil artifact” against two more powerful foes without breaking a sweat. She still has the insults, and she still overreacts, but those emotions are tempered by the years (off-camera) of fighting Daleks. Instead of B-movie action star like she was in Scourge, Aldred plays off a battle-worn soldier who’s got an edge, and surprisingly, does it very well, even if I’m not a fan of this particular version of Ace. Lisa Bowerman is Bernice Summerfield. Really, that’s all one needs to know about her performance. Benny is the consummate “cool” character. She’s never down for long, she’s always got a comment or a remark for any situation, and everyone else gushes madly about just how awesome she is. Now, that’s not quite fair to Bowerman, as even though I don’t like the portrayal of the character, Bowerman is a delight for the part. Any other actress and I might have been turned off completely to the character, but one can hear Bowerman’s sheer delight in her role. She doesn’t play by halves and even though some of her sarcasm seemed like the script said “IF BENNY DOESN’T SAY ANYTHING HERE, PEOPLE WON’T LIKE HER,” Bowerman manages to portray Bernice as a sympathetic hero rather than an annoying one. She just needed to be tempered a bit more in this serial is all. The supporting cast dives into their roles with relish. With a name like Slyde, you know Michael Praed is going to be the bad guy in this story, but even from the beginning, he does what good Doctor Who villains do and hams it up for all its worth. Even though he “dies” in the opening segment of episode one, Andrew Westfield’s Remnex is the eager scientist who will push the boundaries of science to a point…and then Lomar, played by Hannah Smith, will push them the rest of the way. Big Finish regular Toby Longworth plays the evil henchman Broke as an evil butler to the master of the Cult of the Dark Flame exactly as an evil butler should be played. Steven Wickham is also a Big Finish regular, and will replay his role as the android servant Joseph throughout the Bernice Summerfield series as the same character. It doesn’t help that, in the end, the whole thing is just one big cliché, and the characters are just cardboard cut-outs. Well-played and well-acted cardboard cut-outs, but still. Within the first ten minutes, you know who’s going to live, who’s going to do die, who’s going to betray who, and how by-the-numbers the whole “chase the evil artifact so they can’t summon the evil being” plot will play out. There’s very little that challenges the listener to do anything than sit back and listen. I listened to this audio after the brilliant Jubilee and the dreadful Nekromanteia on a long car drive, and several times I found myself having to rewind the CD because I missed a scene or two because I just tuned it out. For a play with an already-long runtime, it made the play seem even longer and a bit more boring. I will praise the story for one thing. People tend to associate the Virgin New Adventures as a whole with over the top violence. While The Dark Flame deals with a death cult and there are several deaths, it doesn’t seem more dark or violent than your average Doctor Who story, there’s one very brutal and violent scene in Episode Three. The listener can sense it coming, and when it hits, it hits HARD. The sound work is wonderful, but cringe-worthy in this sequence. And unlike the violence in Nekromanteia, it affects the plot going forward and alters the character dynamic for the remainder of the serial. I hate giving praise to excessive violence, but here is a case of it actually working in the audio format. However, it’s not nearly enough to save this play, which, despite everything, fails to come together in a worthwhile manner. Final Synopsis – The last trip to the Virgin New Adventures continuity, The Dark Flame has several solid elements, but fails to come together in a worthwhile manner, resulting in a serial that’s passable at best. 2/5. Next up – All aboard, me hearties, for a rip-roaring tale of adventure on the high seas! There’ll be rum for all and sea shanties galore as we travel back in time to join the valiant crew of the good ship Sea Eagle, braving perils, pirates and a peripatetic old sea-dog known only as the Doctor! This entry was posted in Big Finish Review and tagged 2/5, Ace, Bernice Summerfield, Big Finish, Doctor Who, Seventh Doctor, Sylvester McCoy, TARDIS, Virgin New Adventures. Bookmark the permalink.